The full version of MobileMaths program is the most powerful mathematical tool for Mobile Phones and Tablets. The programs are must-have for students, engineers and researchers. 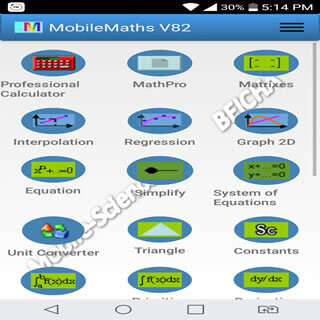 MobileMaths program includes a lot of applications with a large of features. The famous mobilemaths is designed in order to fulfil the needs of every one(student, engineer, researcher... .). By using mobilemaths you can make your handset as home computer and will get substantially all of the computing capabilities desired by a large fraction of the public. All the calculations made by mobilemaths are very accurate. The program is proposed for Mobile Phones and Tablets. The programming statements are the same used for MathPro V7. 1-D Cubic spline interpolation of x/y-values at xi, interpolates to find yi. 1.Non linear fitting tool enables you to perform curve fitting of one- dimensional data using arbitrary (non linear) fitting functions by computing the coefficients or parameters. The tool is based on Nelder-Mead method, which performs an unconstrained nonlinear minimization of the sum of squared residuals with respect to the various parameters. The tool is unique in its kind available for mobile phones and tablets. 2.Polynomail regression finds the coefficients of a polynomial p(x) of degree n that best fits the data in a least-squares sense. 3.Multiple linear regression attempts to model the relationship between two or more explanatory variables and a response variable by fitting a linear equation to observed data. •	User defined regression model (input function) can have many fitting parameters, or variables, and you can use whatever variable names you want to use in your input function. •	The tool implements the Nelder-Mead simplex (direct search) algorithm, to minimize a non linear function of several variables. MobileMaths is absolutely the best mathematical and chemical program you can get for your Mobile Phone and Tablet. As a registered user on www.mobile-sciences.com, you will be alerted of any updates or new products. Simply complete the online registration form, ensuring you complete all the mandatory fields and choose a username and password that you will remembre easily. Should your choice of username be already taken, we suggest you add some numeric element to make it unique. By registering on www.mobile-sciences.com you are agreeing to the terms and conditions of using the website. Unused accounts or registrations with incorrect data entered may be removed from our system.